Health Medical & Family Welfare Department- ACCESS TO FREEMEDICINES- Extension of use of APeRx App in respect of Anti-Hypertensive & Anti-Diabetic Drugs –orders-Issued. Government after careful consideration of the matter, the Govt. of Andhra Pradesh has decided to extend the use of APeRx App, for Anti-Hypertensive & Anti- Diabetic drugs. Accordingly, the citizens can avail a set of drugs approved for hypertension and diabetes any free of cost from private chemists/pharmacy in the state of Andhra Pradesh. 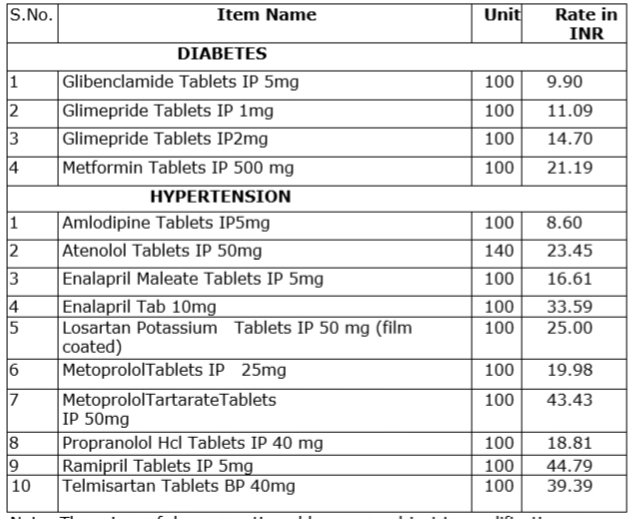 The cost of these drugs shall be reimbursed to the registered Pharmacist/Chemist/Druggist at rate at which APSMIDC procures the corresponding drugs for Government Hospitals. The reimbursement to private chemists will be done directly by the e-Rx App into the registered bank account. 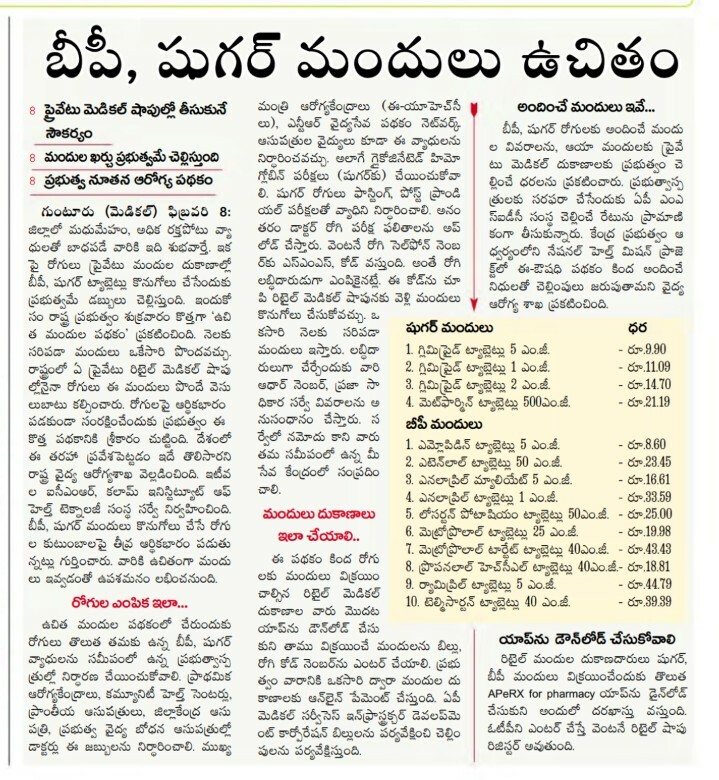 The free drugs in private Registered Pharmacies shall be made available after case evaluation by Physician/Specialist in all Government Hospitals (PHCs, CHCs, AHs, DHs and THs) and Government run PPP centers (eUPHC), based on the diagnostic test results done in these Hospitals and centers, either through NTR Vaidya Pariskha or in-house diagnostics program. Similar benefit shall be available to employees subsequent to their diagnostic check-up in empanelled hospitals of government hospitals. It would be mandatory to have the tests done once every six months whereas private pharmacies would be enabled to prescribe drugs for one month at the time subsequent to APeRx based prescription by Doctors at Government health facilities or Urban Health Centres (eUPHC) that are operating in PPP mode. For Hypertension, the Blood Pressure shall be recorded and for Diabetes Mellitus, HbA1C shall be recorded after from fasting and post-meal blood sugar values as may be clinically indicated. Dispensing of drugs and generating the sales bill. Generation of Weekly consolidated payment details pharmacy wise. Validation & approval of the Payment details by the SPIU with the support of DCA & APMSIDC. Weekly online payment through CFMS. (iii)The Free Drugs Scheme is applicable to all citizens who have been diagnosed as Chronic Hypertension and/or Diabetic case, irrespective of their economic category; provided the diagnosis has been done in a Govt. Health Facility/e-UPHCs. It is completely Voluntary for the pharmacists to participate in this program. It is also completely Voluntary for patients to avail this scheme. However, the patient identification has been linked to Praja Sadhikarta Survey (PSS) and Aadhar. Citizens diagnosed with Hypertension and/or Diabetes are requested to approach the nearest Mee-Seva Counter for inclusion to PSS database if they have any difficult in accessing the free drug scheme. (iv) Combination Drugs shall not be included in this scheme. The Chemists/ Druggists/ Pharmacists are expected to follow stringent quality control for drugs that would be given to public. Drug Control Administration shall devise adequate inspections for facilitate and monitor the quality of drugs.